The methodologies to diagnose hypercalciuria have not yet been standardized. 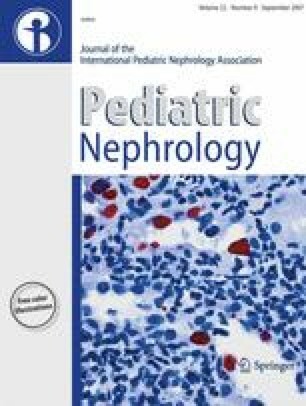 The aims of this study were to assess the correlation between urinary calcium/creatinine ratio (UCa/Cr) ≥ 0.21 (mg/mg) and 24 h urinary calcium excretions and to determine the reference values of the UCa/Cr ratio among a large population of schoolchildren in southern Turkey. Non-fasting, second morning urine samples were collected from 2,143 children aged 7–14 years. In children with suspected hypercalciuria [UCa/Cr ≥ 0.21 (mg/mg)], 24 h urine samples were collected. The 95th percentile values of the UCa/Cr ratio for each age were calculated and showed a decrease in value with advancing age. In all, 269 (12.5%) of the children had UCa/Cr ≥ 0.21 (mg/mg), of whom 66 (24.5%) had daily urinary calcium excretion ≥4 mg/kg per day. A weak correlation was found between spot UCa/Cr ratios and daily urinary calcium excretions in children with UCa/Cr ≥ 0.21 (r = 0.27). We conclude that a spot UCa/Cr ratio of 0.21 (mg/mg) as the upper limit of normal cannot be used universally to define hypercalciuria. Age-specific reference values for UCa/Cr should be established for each population, to be used as a screening test for hypercalciuria, and the definite diagnosis should be established with 24 h urinary calcium excretion whenever possible. The study was supported by a grant from the Scientific Research Fund of Akdeniz University.